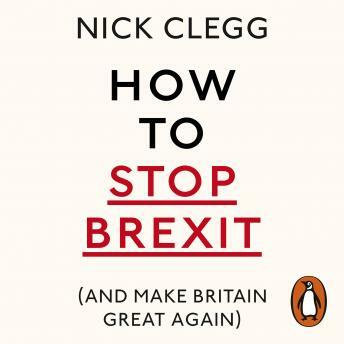 Random House presents the audiobook edition of How To Stop Brexit (And Make Britain Great Again) written and read by Nick Clegg. Keep calm - but do not carry on. There is nothing remotely inevitable about Brexit - except that it will be deeply damaging if it happens. Extricating Britain from Europe will be the greatest challenge this country has faced since the Second World War. And as negotiations with the EU expose the promises of the Brexit campaign to have been hollow, even some Brexit-voters now wish to exercise their democratic right to change their mind, seeing that the most pragmatic option is to ... stop. It would certainly be the best thing for Britain. But how can it be done? Haven't the people spoken? No. In this indispensable handbook, Nick Clegg categorically debunks the various myths that have been used to force Brexit on Britain, not by 'the people' but by a small, extremely rich, self-serving elite, and explains precisely how this historic mistake can be reversed - and what you can do to make sure that it is.